The Story of Fairy Rings Has Always Intrigued Me! 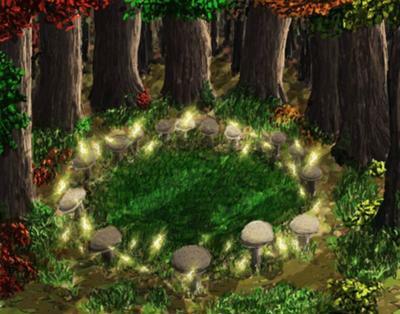 The English believed that fairy rings were where fairies came to dance and celebrate, the mushrooms of the rings were used as stools for the fairies to recuperate during the evenings festivities. One European legend tells of the origin of these rings as being burned into the soil by a sleeping dragon's tail. My husband was looking out our kitchen window and called me to see something. He knows I'm into mushrooms and pointed across the driveway along a fence. These little fellas look like they are lined up to see, oh, maybe something like a fairy ring take place. Hmmmm! Comments for The Story of Fairy Rings Has Always Intrigued Me! Wow! I enjoyed that article of yours soooooo much! I shared it on facebook. Oh, the picture I used was a free pic I found somewhere on a site on my computer. Back to your story, BRAVO!!!!! My full page about fairy rings is now here. Burned into the ground by a sleeping dragon's tail?!!? That is just too cool. Thanks, Jane, I learned something today! And yeah, fairy rings have always intrigued me too. There's definitely something magical and imaginative about them. Hmmm...I think you've inspired me to write a page about fairy rings this week!